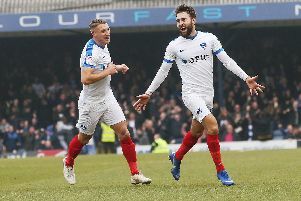 GARETH EVANS has handed Pompey an injury boost. The stand-in right-back is expected to be fit for this Saturday’s trip to Crawley. And that means Evans is ready to maintain his unbroken league run for Paul Cook’s side. The 28-year-old was taken off at half-time in Saturday’s victory over Leyton Orient. Evans injured his ankle following a crunching tackle from O’s midfielder Sammy Moore early on at Fratton Park. That eventually saw him withdrawn at the break, with Carl Baker dropping back into his position. Cook stated after the game that Evans felt some soreness with the problem, but he’s now expected to be in contention for Saturday’s trip to the Red Devils. That means he will be available to extend an unbroken 21-game run in the league. All but one of those outings have arrived in a right-back role for the former Manchester United trainee, since he dropped back into the position against Crawley last September. His form there has kept Drew Talbot and Adam Buxton out of the side after their returns from injury. Meanwhile, the Blues will check on the fitness of Milan Lalkovic who missed out against Orient with an ankle injury. The Slovakian picked up the injury in training last week. Lalkovic has not started a league game for Pompey since the win over Wycombe, also last September. The 24-year-old’s last start for Cook’s side came in the 1-0 Football League Trophy win over Bristol Rovers in November. He was given 28 minutes as sub in the loss at Doncaster earlier this month. Striker Curtis Main remains injured with an abdominal issue. The 24-year-old has been out since October.